One of the pictures in this show is well-known to me through my interest in interior decoration. 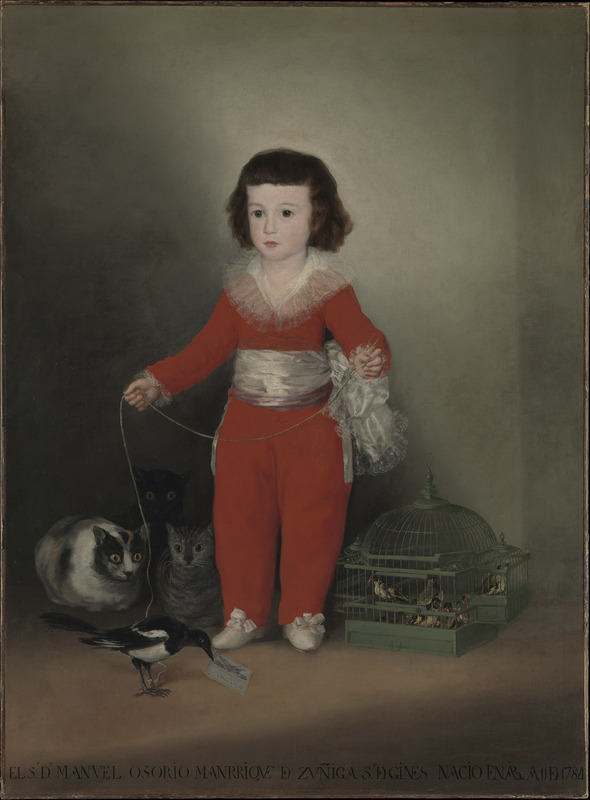 It is the famous portrait of Manuel Osorio Manrique de Zuñiga, who in this exhibition is reunited with Goya’s portraits of his father and mother and sister. The portrait was bought from the famed art dealer Joseph Duveen by the American banker Jules S Bache in 1926 and it is believed that his daughter Kathryn was the driving force behind this purchase. The latter was better known as Kitty Miller, wife of the renowned theatre producer Gilbert Miller, and she employed the noted designer Billy Baldwin to decorate their homes in New York, London and Mallorca. It is her New York home that is the focus of this story for when Bache donated his collection to the Metropolitan Museum of Art in 1949 there was a specific condition and that was that the picture could hang in Kitty’s drawing room for half the year. In his book Billy Baldwin Remembers Baldwin recalls that when the painting was first hung in the drawing room the Millers sent out cocktail party invitations to New York society to come and meet Don Manuel Osorio de Zuñiga. So each year it hung there to Kitty’s great delight until her death in 1979, although in Legendary Decorators of the 20th Century, the famous interior decorator Mark Hampton says that “As she grew older, it became annually more difficult for the Met to get the painting back”. Well, one can totally understand why she had such affection for this painting and now it is our turn to go and meet him. While there are no cocktails being served there is the delicious treat of seeing more than sixty of Goya’s remarkable portraits. It is such a good show you will most likely want to visit more than once – just like visiting the Miller’s!